Home Politics Cartoon PGurus salutes two of India’s best Raksha Mantris. Om Shanti. 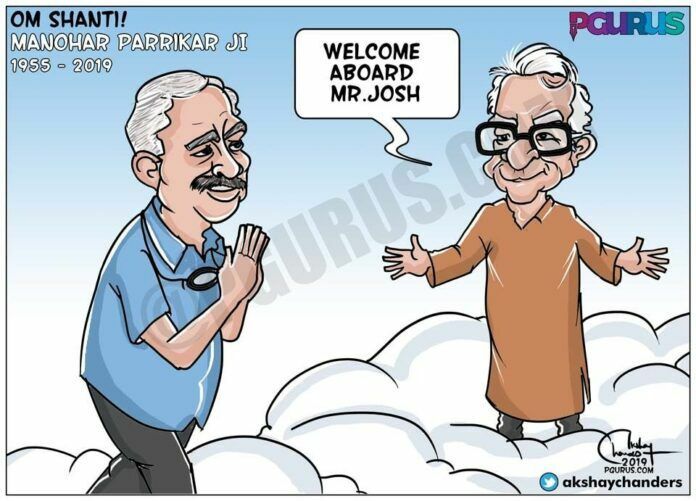 I admire George and Parrikar. George, if my memory serves me correct visited Siachen 18 times. Parrikar finished 65 years old dream on OROP for defense forces. Both are giant patriots. George Fernandes policy of sending the bureaucrats to border posts including Siachen is brilliant. The tradition should have continued. Modi should have revieved that policy of sending every bureaucrat to border posts & ask them to work from there for at least 3 months, so that they know the life lead by the defense forces.